Explaining ghosts is one of the great aims of my life. Of course, to many ghosts are spirits so there is nothing to explain. However, careful investigation of ghost cases offers no compelling evidence that ghosts are spirits so, for me and some others, it is back to the drawing board. The problem starts with the fact that the popular ideas about ghost appear to derive largely from tradition, legend and fiction rather than real cases. Humans are strongly influenced by such cultural transmission of information. Looking at real life cases , though, a different picture of a ghost emerges. It can be summarized as: "a ghost (or apparition) is a human (sometimes animal) figure, witnessed by someone, which cannot be physically present". That is how witnesses recognise something seen as a ghost, so it makes an obvious starting place to search for explanations. So what IS the explanation for ghosts? But who says there is only explanation? Shouldn't a single phenomenon have just one explanation, you may ask? I'd reply yes. However, ghosts are not a single phenomenon. Anything that can produce the impression of a human that is not physically present can produce a ghost. It is culture traditions, rather than case evidence, that tie all these sightings together as a single phenomenon. Note that the two xenonormal explanations combined cover all the ghost properties listed. This does not mean they explain all ghost sightings. For misperception to occur there must be an object (if only a shadow or pattern of light on a surface) to be misperceived. For hallucinations to occur the witness must obviously hallucinate. I strongly suspect that both causes are under-reported. I have included one paranormal explanation, 'recordings', for comparison. It is clear that we do not need recordings' to explain most ghost sightings. So, I think there would need to be additional evidence supporting the idea a recording in a particular case before that explanation need be considered. If. for instance, the ghost sighting went into a continually repeating loop, as recordings can, it would become a possibility to be at least considered. There are other possible explanations for ghosts, obviously, some xenonormal , some paranormal. OK, this is getting truly spooky now! Regular readers will be aware that I have noted my apparent tendency to see more celebrities, while going about my everyday business, than might seem 'normal'. I calculated that I see about 0.23 per month. I have not been able to discover an average rate for the general population (can anyone help with this?) but that seems high to me,. The latest celebrity was a well-known radio and TV presenter spotted at a concert recently. No, not on stage, in the audience! But here's where it gets spooky. Back in April I wrote, that (23 April 2015): " I'm expecting my next celebrity in around 4 months! ". Now, of course., 0.23 is just an average, it doesn't mean that celebrities will turn up every four months on cue. Except that, in this case that's exactly what appears to be happening. So, I saw my next celebrity in August (see here). And here we are four months on with the next one, right on time. So is this more than a coincidence? Could I be deliberately trying to see celebrities every 4 months and not in between? Well, I certainly recalled the celebrity thing at the beginning of the month, wondering if it was going to happen again. However, I subsequently forgot all about it. I haven't made any special efforts to find celebrities .Even if I did, these wouldn't count as the whole point is that I DON'T seek seek them out. Nor have I tried to avoid celebrities. Indeed, most of the time I don't remember the 'celebrity effect' at all. So, it all comes down to me going about my everyday life as normal and simply seeing celebrities when they happen to appear. Which is, currently, every four months! So, if this bizarre pattern is to continue, I should see my next celebrity in April 2016. If that really happens then it will be truly amazing! I enjoy people watching. When standing around waiting for a bus, for instance, I like to imagine the people around me are about to be witnesses to an anomalous event. How accurate would their accounts of the incident be? Those watching their phone and listening to music probably wouldn't notice much but what about the others? Recently I was standing at just such a bus stop when I heard a strange noise. It was quite loud and obtrusive. I knew what it was because I'd heard it before, but only twice. I looked for what I knew would be the source but could not find it. The odd thing was that no one else at the bus stop seemed remotely interested in the sound at all, even though it was rather unusual and clearly originated nearby. Casual observations like this lead me to think that there could be a lot of unreported strange incidents going on all the time. Most people seem to notice little of what is going on around them, even when it unusual. I also wonder how much detail witnesses might recall if they actually DID notice something strange. And how much of what they recall would be accurate (see here). There is an effect I've noticed about witnesses that I've mentioned here before. It is this; if you ask them questions about factors that might show a natural cause for their observation, witnesses will often recall events, that they have not previously mentioned, that support a paranormal interpretation. When this happens I recall watching potential witnesses apparently oblivious to their surroundings, odd or otherwise. It would be great to study witnesses actually in the act of observing strange phenomena 'in the wild', as opposed to a staged incident. The chances of this happening by chance, with a convenient nearby CCTV for instance, are slim. We will probably have to wait for wearable lifelogging equipment to become commonly worn (if it ever does) to record such things. In my own case, I quite often come across odd things and always try to actively investigate their possible origins at the time. I've recorded many such examples in this blog. However, I am always on the lookout for strange phenomena and have some good ideas of their causes beforehand. These factors make me, I suspect, an atypical witness of strange phenomena. And the photo? It shows a strange golden sheen on some waves in the sea. 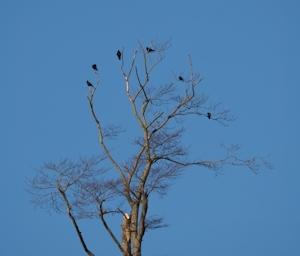 It might not be obvious, just from this cropped photo, what the cause of this phenomenon is. A clue is at the top of the shot where you can just see the support pillars of a seaside pier. The golden effect is a reflection of bright lights on the pier in the highly agitated seawater below. And the strange noise at the bus stop? It was the alarm call of a Grey Squirrel. Despite belong a long time amateur naturalist I've only heard the sound a couple of times before so I think it unlikely that many, if any, of the other people at the bus stop knew what it was. 4 December: Do 'false steppers' see more ghosts? I nearly ended up sprawled on the stone floor. Luckily I managed to recover from my stumble and stay upright. I was merely embarrassed rather than injured. I was walking down some stairs in a busy public place. 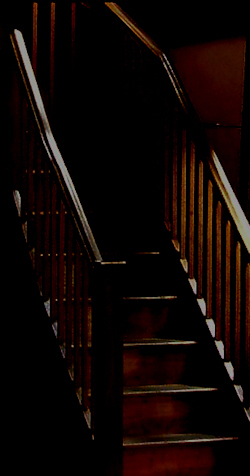 I knew what had caused me to stumble at the bottom of the stairs. I have done it a few times now and have decided to call it 'false stepping' (with apologies to anyone who has already named the phenomenon). What I saw as I went down the white stone steps was much like the diagram (right). The floor below the steps consisted of the same, or a very similar, stone to the steps. As you can see the first joint between floor slabs was parallel with the steps and at a similar distance from the steps as the tread width of the stairs. The next joint was much further away. 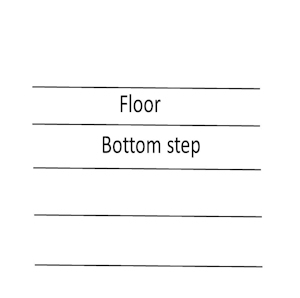 So, the bit labelled 'floor' in the diagram resembled another step and that is certainly how I saw it and why I treated it as such. I think these 'false steps' I do from time to time, in similar circumstances, are a result of the fact that I tend to notice misperceptions that most people never do. I first started noticing misperceptions a few years ago when i realized that they are part of normal human perception. Ever since then I have seen ghosts and other visual objects that were not actually what they appeared. So, what did my embarrassing stumble teach me? Firstly, since not one of the many other people around at the time stumbled, I'm guessing that noticing misperceptions is rare in the population, as are people who see ghosts. Secondly, I've realised that noticing misperceptions can cause accidents! So, there are down sides to noticing misperceptions, including false stepping. 3 December: Shadow ghost in 3D? I was wandering beside a development of new flats when something caught my attention. A poster I was walking past appeared to be in 3D! As I moved, my point of view appeared to change just as it would for a real 3D scene. However, I could see it was plainly a flat 2D picture and, on close inspection, nothing actually moved relative to other objects in the background. Incredulous, I went back and tried it again and saw the same bizarre effect! It worked even though I knew it wasn't real. I've never seen a picture do this before. The effect occurred in full daylight (overcast). I think it was a misperception phenomenon where my unconscious perception system was overruling my conscious knowledge of what I was seeing. There were other posters nearby but the 3D effect only occurred on this one. So what was special about it? The picture was of an interior of a flat. Importantly, it was life size and at street level. In other words, had it been a real room, I could have simply walked into it and everything would have looked normal. The other posters were smaller than life size and elevated above the street level by a metre or so. I think the fact that it looked as though I could walk over into it was crucial. Misperception relies on expectation. I don't recall seeing similar life size street height posters before which is probably why I've never noticed the effect before. What does this have to do with the paranormal? I think it shows that misperception is not just about visual object substitution I now think it can make scenes appear to have depth when they have none. Examples might include shadows on a wall or a mural in low light. If shadows on a wall involved a shape resembling a human figure it might be interpreted as a shadow ghost. And if someone suggests it was in fact just a shadow, the witness might reply that the ghost moved relative to its background as they moved so it must have been three dimensional! Until now that might have been a pretty good argument but not any more! MA looked down to see a man crouching. Disturbingly, the man was staring up at MA. Even stranger, the man then vanished. So, a ghost then! The incident happened on a train. MA is my acquittance who has microsleep with REM (MWR) experiences. I have recounted some of MA's bizarre experiences before. This one falls into a group of such experiences where a dream element, the crouching man in this case, is added to a real life scene. It is likely that such scenarios would be reported as ghosts by people who had MWRs but were unaware of their true nature. As in some similar experiences, MA reports that there was an undefinable feeling that something unusual was going on. Aside from that the experience felt completely real. What was interesting about this latest incident is the apparently strange behaviour of the ghost. MA saw a staring figure on a train before over a year ago (see here). There are clear parallels between the two accounts - both involved silent, still staring ghosts. The big difference is the apparently strange behaviour of the ghost this time - crouching down low for no obvious reason. Unlike the previous experience, MA was not able to describe the man. This may have been because the unusual behavior was distracting. I can see no obvious reason why a ghost should crouch but if anyone knows of other examples, please let me know. The proportion of strange incidents MA experiences on trains is high. It's more likely because train journeys encourage MWRs than that trains are particularly spooky. Sitting around for long periods, the gentle motion and sound of the train may well be conducive to MWRs in those susceptible to them. Amazingly, MA never misses the train stopping at stations due to MWRs, which is just as well. Maybe it is feeling and/or sound of deceleration. Last month's November) website figures are an average of 15998 hits per day. This was down on the previous month's 18252 daily average.